Right about the time that The Fault in Our Stars came out, TIME magazine wrote a review, waxing poetic about how different the novel was and how genuine it was. I can’t remember what exactly was said but I remember that the reviewer had made it sound like a wonderful book. It’s rare that TIME magazine reviews young adult novels and The Fault in Our Stars review was probably the first that they did since I started reading TIME. Like a lot of books that I tell myself to read, I never actually read The Fault in Our Stars until recently. I was busy with family affairs that I don’t want to delve into when the novel came out. It was over the summer when people on Twitter brought up The Fault in Our Stars that I remembered the TIME magazine review and the fact that I wanted to read it. A friend loaned me The Fault in Our Stars and I was reading it on-and-off. It’s a slow book but totally compelling, filled with bursts of humor, as Jodi Picoult says, and genuine truth. Hazel Waters is a terminal cancer patient and has been for the past few years. She attends a Cancer Support Group at the hospital, where she meets Augustus Waters, another cancer patient. Now before you roll your eyes, it’s important to remember that TIME magazine called the novel a different cancer novel. (I can’t remember the exact words that they used.) The Fault in Our Stars is a novel about love, grief, cancer, living, dying, and being a teenager. It’s not a novel about how crappy cancer is and moping around is justifiable. No. 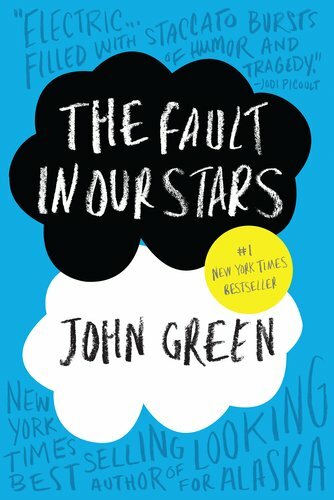 If I only had one sentence to say about The Fault in Our Stars, it would be this: The Fault in Our Stars is a Sad Novel (capitalization on that is intended) but at the same time, it’s a thought provoking novel about life and the universal questions that surround it, no matter at what age. Both Hazel and Augustus live with cancer, as Augustus says that he is cancer, but they try to live normal lives, not letting cancer define who they are as people. It is because that they have cancer that Augustus and Hazel contemplate questions such as “Will I be remembered?” “What mark will I leave behind?”. Both of them so do with audacity and perhaps a sense of innocence that is slipping away since they know that they might not have much time left. Augustus says, “The real heroes anyway aren’t the people doing things; the real heroes are the people NOTICING things, paying attention. The guy who invented the smallpox vaccine didn’t actually invent anything. He just noticed that people with cowpox didn’t get smallpox." Hazel and Augustus both use big words and talk in an intellectual way however it doesn’t distract from the readability, instead it adds to it. There’s a quirky edge to The Fault in Our Stars because of it and it adds a sense of genuineness to the novel. Sometimes when I mention The Fault In Our Stars to people, I get this immediate reaction of “Augustus!! ♥” . I’m bothered by it. Maybe it’s because my life is so affected by cancer and death that I think of how brilliantly the novel portrays cancer, grief, tragedy, and the act of being alive that I can’t think of how amazing Augustus is as a character as a first thought. This novel isn’t just a romance novel; in fact, it’s so much more than that. It’s a novel about living, rather than dying, even if cancer is present. Cancer isn’t really the focus point of the novel. It’s through love, cancer, and tragedy that John Green sends his message about how screwed up life can be sometimes and how there’s so much more to life. The Fault in Our Stars blew me away by its simplicity and the depth. It was perfect in every way and John Green achieved everything that he set out to achieve in this novel. Is this your first John Green book?? BTW, your review is so beautifully written! I'm so jealous!